"Prime ministers and ministers know" about Muslim damage to Temple Mount, Knesset is told. The Knesset's Education Committee discussed Tuesday the ongoing damage to the Temple Mount caused by Muslims. The Chairman of the Antiquities Authority, Shuka Dorfman, told the committee that "the Temple Mount is an antiquities site that is not supervised by me like the other antiquities sites are. There are limitations on the supervision. We work in cooperation with the police. We know what goes on there even without being there – I am not pleased with what goes on in the Temple Mount." "The authority to approve or prevent [excavation] work [on the Mount] is in our hands and I have received criticism for it. I do not want to criticize, bit prime ministers and ministers know what is going on atop the Temple Mount," Dorfman said, hinting at Prime Minister Binyamin Netanyahu. MK Aryeh Eldad told Arutz Sheva after the committee session that "there is systematic destruction of antiquities organized by the Waqf and the Islamic Movement in order to build the ideological infrastructure for the claim that our Temples never existed. Our prime ministers over the years have surrendered to the Waqf and were willing to accept their rampage on the Temple Mount." MK Tzipi Hotovely (Likud), who initiated the discussion, said that "there is a dereliction of Israel's sovereignty on the Temple Mount. Day after day, another bite is taken out of our sovereignty. I ask that the State Ombudsman's report regarding the Temple Mount, the most holy site for Judaism, be made public." A member of the Public Committee for Prevention of Destruction on the Temple Mount, Yisrael Kaspi, said bluntly: "We blame the Prime Minister. There is criminal negligence, there a state of anarchy, destruction is being carried out and by now it cannot be undone." 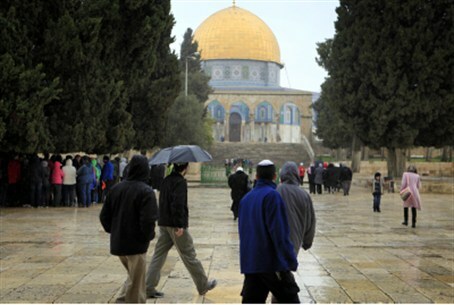 Kaspi said that instructions have been issued forbidding work with tractors atop the Temple Mount and forbidding work under the cover of darkness – yet the damage continues. "I am fuming mad," he said. He asked the committee to call on the government to supervise and safeguard Israel's national treasures. The police representative, Lt. Col. Avi Biton, told the committee that the police supervise the Mount 24 hours a day and have access to all spots on the Mount. At present, he said, there is only one tractor on the Mount that transports equipment from place to place. "The continued, deliberate and illegal destruction of archeological remains from the Temple Mount with the tacit approval of the Israeli government is an unforgivable crime against the people of Israel and an attempt to eradicate all Jewish connection to our holiest site, “ said Rabbi Chaim Richman, Director of the International Department of The Temple Institute. “This is exactly why the Temple Institute is calling on people worldwide to observe the 2nd of Nissan (March 25th) as International Temple Mount Awareness Day to highlight and celebrate the centrality of the Temple Mount, the theme of the Holy Temple and its intrinsic connection to the Jewish people” he added. Rabbi Richman is the host of Israel National Radio's Temple Talk podcast.